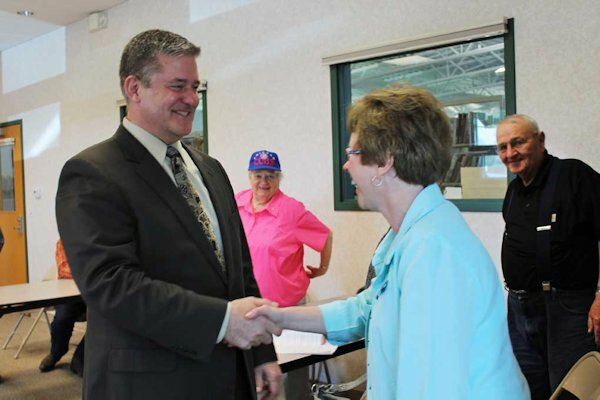 Illinois State Treasurer Dan Rutherford came to the Henderson County Library Tuesday to encourage Henderson County folk to check for property that might belong to them. "There are 175 addresses registered here in Henderson County", Rutherford told a group who came to meet their State Treasurer and hear about the unclaimed monies in Illinois. Rutherford says checking once a year just isn't enough because his Unclaimed Property Division (UPD) is constantly taking in new properties. "Everyone should search the I-Cash database at least once each month. It's common for people to check one month and find no properties in their names, only to return the next month and find cash or other property on the list," explained Rutherford. As an example, Rutherford said, "My office took in 198,796 new properties just in the first quarter of 2013. One of the properties could easily be yours!" Rutherford said, "We've designed the system to load every Sunday morning and we've heard from people who were surprised to see that their name popped up shortly after the last time they searched." One in eight Illinois residents has property in the database. Dan Potts of Biggsville was in attendance and found out that a couple of his family members had unclaimed property, and a few other people he knew. None of them was over $100, but it is surprising to see it there, he said. Rutherford said the more often you search your name and names of family members, the sooner you could discover property, and the faster you'll have it back in your hands. He said last year, the office added a total of 1,142,645 new properties (95,220 per month). He explained that various industries report unclaimed property to the treasurer's office either on May 1st (business associations, utilities, life insurance corporations) or November 1 (government entities, all banking and financial organizations). "The bulk of transfers happen immediately after these deadlines." In 2013, I-Cash has returned $30 million in property in the first quarter. Rutherford has broken Treasurer's office records for returned property in each of his first two years in office. "While the Treasurer's office previously returned about $82 million each year, Rutherford returned $101 million in 2011 (24% increase) and $129 million in 2012 (27% increase), and this quarter, the number of claims paid in the first quarter of this year is 18,340, which is up by 20% over the first quarter of 2012. It's some good news in what usually is a state with doom and gloom to report in state government. Rutherford said that costs for marketing and supporting the I-Cash program are not paid for with tax dollars; instead, the program is funded through the Unclaimed Property Trust Fund. Money orders and Bill overpayments. You can contact the Unclaimed Property Division by calling 217-785-6998 although searches cannot be completed by telephone or by emailing to info@Icash.illinois.gov. Henderson County Library Director Anita Smith welcomes Illinois State Treasurer Dan Rutherford to the county library in Biggsville Tuesday as Joyce Louden and Meredith "Mert" Flatt looks on in the background.